Truth be know, it had been quite some time since I heard anyone refer to a church key for either of the term’s two meanings until recently. My ears perked up however, when I overheard my friend and mentor at the Naples Monitor, Morris Craig, engage the Methodist church secretary about the small brass device used to disengage the lock securing the front door at the Northeast Texas house of worship. I was slightly embarrassed, however, that my first connotation at hearing the phrase wasn’t Sunday go-to-meeting related. What it did call to mind was a friend in Boerne, Doug Dugosh, who was a local entrepreneur of distilled spirits down in the Hill Country when I lived there. The story he related to me some years ago was about a lady who came in his place of business one day and asked him for a church key. He said he handed her one, she thanked him and left. “A church key,” Doug said he told the pair who appeared to be in their early 30s. He said he could tell by the blank stare on their faces that they didn’t have a clue what he was talking about. “I had to explain to them what a church key was,” he laughed. A church key was a commonplace item when I was growing up in Mount Pleasant in Northeast Texas. Although some may not have known both meanings of the term, I had learned what a church key was from my father and I didn’t know of anyone who ever had to ask what it was. On the other hand, purchasing products of the brewer’s art was not as convenient then as it is today. Maybe that’s because there were no convenience stores then. Securing a case of “Jax, the beal jeer,” as the slogan of the day playfully advertised my dad’s preferred brand, required a drive of 30-40 miles across a couple of counties and at least three rivers. In those days, the can tops were as smooth and flat as the parking lot down at the local Esso filling station. The individual who invented the “pop top” had yet to come up with that million-dollar brainstorm. This prehistoric hurdle was not unique to cans however. Bottles of everything from Pepsi to Pearl were capped with lids that required a tool to access the container’s refreshing contents. 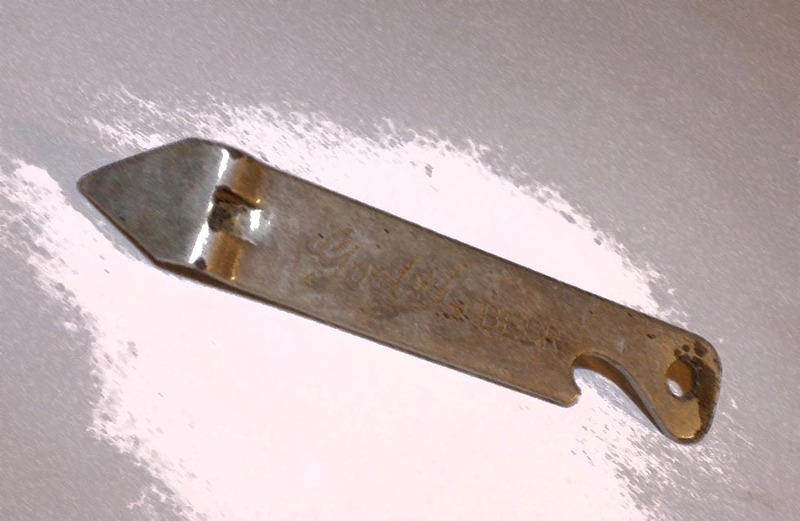 The required tool, a church key, had a piercing point on one end to puncture cans on one end while the other end was round and designed to remove bottle caps with ease. Just as cans devoid of pop tops were weren’t unique to beer cans, church keys were not unique to beer drinkers. It was also commonplace at one time to find one wired under the hood of a car, convenient for opening cans of motor oil also requiring a tool in order to release the can’s contents. Either way, anyone who has been hot and frustrated without a church key to open a cool container of beverage, or an essential can of oil for an old Chevy six cylinder, will never place a small value on the convenience of a church key. On the other hand, I may need more than a small convenience to get out of the trouble I could be in for tying beer cans and the church house together in one tribunal. I wonder if the preacher remembers church keys? You are correct, they were everywhere except when you really needed one. That is why I believe two of mankind’s greatest inventions are pop top cans and air conditioning. And, two convenience inventions that compliment each other when enjoyed together. I once had one on a piece of braided nylon cord hanging from the rear view mirror of my ’64 Chevy…..the cord was just long enough to reach the floorboard and said “church key” would lay there so that it wouldn’t be swinging around from the car movement and was long enough to be accessible from either the driver or passenger side. Now that’s ingenuity at its best!